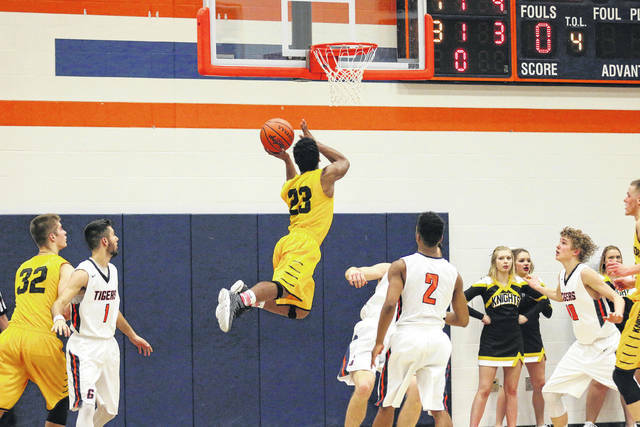 Erin Miller | Galion Inquirer Northmor’s Meechie Johnson soars through the air for two of his 24 points on Tuesday against the Galion Tigers. The Golden Knights survived the Tigers to move to 13-0 on the season. GALION — The boys basketball game between the hosting Galion Tigers and the visiting Northmor Golden Knights that took place on the evening of Tuesday, January 23 did not go quite how anyone thought that it would. Entering the game, the Knights held a 12-0 season record and many thought them to go into their highly anticipated clash with St. Peter’s on Saturday still undefeated. Prior to the game on Saturday, Northmor would face Galion (5-8, prior) on the road and then host the struggling Cardington Pirates (now 3-14) on Friday. To many, the game against the Tigers on Tuesday was just a step closer to a potential perfect season but to Galion and to Northmor, it was quite the contrary. With Northmor controlling the opening tip, it took all of seven seconds before the first whistle of the contest as the Tigers Jack McElligott was called for the foul against one of “The Trees” also known as Tyler Kegley. Time went on and it became apparent that Galion refused to go lightly against the favored Golden Knights. As the buzzer for the first quarter sounded, the Tigers actually led the Knights; 12-10. That was before the ref blew the whistle as Northmor’s Meechie Johnson was fouled heaving a desperation buzzer-beating attempt. Meechie would convert two of the three at the stripe to tie the contest up; 12-12. The Knights, appearing to be somewhat out of rhythm would regroup on both ends of the floor, outscoring Galion in the second (20-14) thanks in large part to the full-court pressure applied by the Northmor defense. The Tigers Isaiah Alsip sat uncomfortably on a chair on the sidelines for the second frame after picking up two quick fouls in the first quarter. At the break, the visitors found themselves up by a tally of 32-26. To begin the second half, it was much the same story; a true back-and-forth slugfest between opponents similar to David versus Goliath. The third quarter came to an end and with 24 minutes in the books, it was the visitors clinging to an anything but safe eight-point lead; 52-44. With only eight minutes remaining between another win for the Northmor Golden Knights or a shocking upset by the Galion Tigers, the action really started to heat up. Both sides of the stands were simultaneously thundering with cheers and jeers or eerily silent. Fast forward to just under five minutes remaining in the contest and Galion narrowed the Northmor lead to just two points at 56-54. With players diving all over the floor, tough fouls in the paint on gutsy drives and another two-plus minutes gone, Tigers head coach Matt Valentine calls timeout after Alsip nails a triple to bring the score to 60-59 in favor of the visitors. Galion would then proceed to take the lead with just a shade over a minute and a half remaining; 61-60. With just 25.4 seconds remaining, Northmor’s Blake Miller scored on a putback and was fouled. At the line, Miller showed poise for a sophomore and hit the free-throw to put the Knights back on top. Just 3.6 seconds remaining in the game, Kyle Kegley was fouled on the interior and sent to the line for a one-and-one. Kegley would hit the front-end dagger and finish it off with the second to secure the win for the visiting and still undefeated Knights; 69-65. The Tigers fall to 5-9 overall on the season and currently sit in fourth place in the Mid-Ohio Athletic Conference standings at 3-5. Northmor remains unscathed at 13-0 and currently sit atop the Knox-Morrow Athletic Conference at 8-0. Alsip would finish the evening as Galion’s top scorer with 27 points after scoring just six points the entire first half. Alsip also grabbed five rebounds, dished three assists, recorded one steal and one block. Although the home team had many non-quantitative contributions, no other player would finish in double figures. Stats for the Galion squad on Tuesday were: Team- 21/38 from the interior, 6/22 from the perimeter, 5/8 from the free-throw line, 25 total rebounds (8O, 17D), 8 assists, 7 steals, 4 blocks and 13 turnovers; Jack McElligott- 9 points, 3 rebounds, 2 assists; Zhamir Anderson- 8 points, 2 rebounds, 1 assist, 4 steals, 1 block; Nate Eckert- 7 points; Tristan Williams- 6 points, 1 rebound, 1 block; Colten Skaggs- 5 points, 10 rebounds, 2 steals, 1 block; Colton Powell- 3 points and Gage Lackey- 4 rebounds, 2 assists. For the visitors, four of the six players that saw action against the Tigers finished in double figures, led by Meechie’s 24 point performance. Johnson also added three rebounds and an assist on the night. K. Kegley finished the game with 14, Brock Pletcher added 12 and Miller rounded out the double-digit scorers with 10 points. Other stats for the visitors in the victory were: Team- 19/36 from the inside, 6/13 from the outside, 13/23 at the charity stripe, 27 total rebounds, 10 assists, 6 steals, 8 blocks and 15 turnovers; K. Kegley- 8 rebounds, 2 assists, 5 steals, 5 blocks; Pletcher- 2 rebounds, 4 assists, 2 steals; Miller- 2 rebounds, 1 assist, 1 block; T. Kegley- 8 points, 12 rebounds, 2 assists, 2 blocks and Lane Bachelder- 1 point, 2 rebounds, 1 steal. In addition to the games on Friday and Saturday for the Knights, they will be back in KMAC Championship pursuit on Tuesday, January 30 when they travel to Howard to meet up with the East Knox Bulldogs. Galion will play their next seven games in a row at home, starting with a non-conference matchup with the Buckeye Central Bucks on Thursday, January 25. The following evening, the Harding Presidents will head to Galion to meet the Tigers for an MOAC battle. In a game that was originally scheduled as a road game, the Tigers will now play host to the Clear Fork Colts on Thursday, February 1.
https://www.galioninquirer.com/wp-content/uploads/sites/38/2018/01/web1_IMG_8775.jpgErin Miller | Galion Inquirer Northmor’s Meechie Johnson soars through the air for two of his 24 points on Tuesday against the Galion Tigers. The Golden Knights survived the Tigers to move to 13-0 on the season.